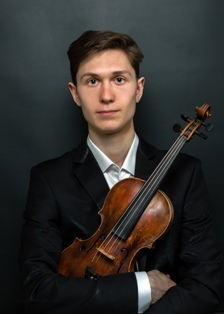 Fedor Malykhin is the Prize Winner of national and international competitions including Ohrid Pearls International competition in Macedonia (2016), ‘Rizzardo Bino’ International competition in Italy (2016), ‘Concerto with Orchestra’ in Russia (2014). Fedor has taken master classes with Maria Kesselman, Eugenia Chugaeva, Michael Kugel, Anna Kandinskaya, Gernot Winischofer, Alexander Schustin, took part in ‘River of Talents’ in Sankt-Peterburg where has been choosen for performing Schostakovich Violin Concerto No. 1 with Togliatti Philharmonics Symphonic Orchestra. Fedor has received bachelor’s degree at Gnessin Russian Academy of Music and continue study there, in the Master class of Alexander Dogadaev. You can listen to Fedor here. If you are interested in working with Fedor, please get in touch with the EMCY Office.